Like regular car maintenance, routine RV maintenance is essential for making sure your RV is in tip-top working shape. Poor RV maintenance can result in breakdowns, causing unexpected travel delays, and unwanted stress. From basic RV maintenance services such as oil changes and wheel alignments, Complete Car & RV Repair is your one-stop St. Charles RV maintenance resource. Our computer diagnostic equipment accurately identifies problems so we can offer solutions. Our St. Charles RV maintenance facility also has a dump station and propane and water filling stations. Our onsite dog park lets our customer’s friendly, four-legged companions stretch their legs. It is our goal to deliver excellent service and superior customer care. Passing through the St. Charles and St. Louis area and have an RV problem? Don’t worry! Complete Car & RV is conveniently located in St. Charles near major highways. Let us check out your RV so you can return to your travels, worry free! We eliminate the guesswork. 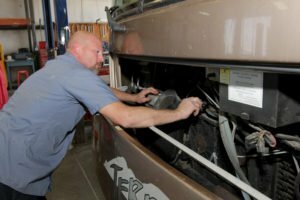 Trust your RV maintenance to the certified experts at Complete Car & RV Repair and know that the job will be done right. We provide professional RV maintenance services to all classes of RV makes and models and honor all warrantees. We don’t cut corners and don’t recommend any unnecessary repairs or service. Your best interests are our top priority. We know that RV maintenance, while necessary, can be costly and unexpected repairs can put added pressure on budgets. Check out our pricing and see how we compare! We are confident that you will be happy with our prices and that our personal service and superior customer care will exceed your expectations. Preventative maintenance services such as oil changes, wheel alignment, brake adjustments, etc. 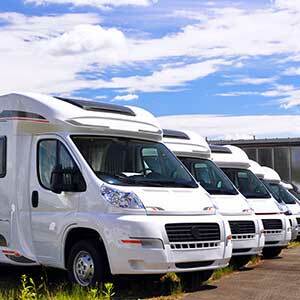 Complete Car & RV Repair is proud to offer maintenance, repair, and storage services for RVs all under one roof. We also have an onsite dump station, propane and water filling stations, and an onsite dog park for your friendly companion. Your time is valuable! Discover the time-saving benefits of choosing Complete Car & RV Repair’s services.